18kt rose gold case with a brown leather strap. Fixed bezel set with diamonds bezel. Ivory dial with luminous hands and diamond hour markers. Hour, minute, second, date. Dial Type: Analog. Date display at the 3 o’clock position. Automatic movement. Scratch resistant sapphire crystal. Pull / push crown. Case diameter: 40 mm. Round case shape. Tang clasp. Water resistant at 50 meters / 165 feet. Functions: date, hour, minute, second. Luxury watch style. Watch label: Swiss Made. 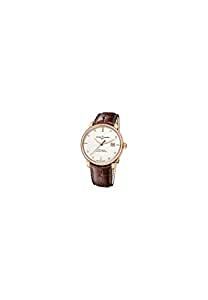 Ulysse Nardin San Marco Classico Ivory Dial 18kt Rose gold Diamond Brown Leather Mens Watch 8156-111B-2-991.